There is a common condition that causes pain in the area just forward of the outside ankle bone. If you poke around this area, you will find a deeper spot where you can push your finger further inwards than in the bony areas that surround it. This is the Sinus Tarsi and the Subtalar Joint. Often the pain is difficult for the sufferer to pin down though and is generally just described as being in the outside ankle area. Between the two long leg bones at the ankle is a small blockish bone called the talus that has a bottom surface that is roughly horizontal It sits on top of the heel bone / Calcaneus which again has a roughly horizontal top service. The joint comprised of those two bones is called the subtalar joint. This joint sits around 3 cm below the ankle joint and, where the ankle joint can only move in one plane (up and down like a head nodding), the subtalar joint is where your foot can move in every plane, making circular rotations and dealing with uneven terrain underfoot. The subtalar joint is a very complex joint with three articular facets. This means that three pairs of cartilage coated bony processes rub together during each part of the joint’s movement. The top bone is shaped like a horse’s saddle and the lower bone is equally contoured in the reverse way. While it is difficult to visualize the joint at work, some idea of the concept will help to better understand this condition. Imagine that you went to the gym and used up a heavy hand weight. If you did bicep curls the correct way – without straightening your elbow all the way out – you would not expect to have an incident. If instead of this, you flung your arm out straight until your elbow joint was forced to stop the movement because you have reached the point where bone hits onto bone, you can see that you would hurt yourself. This is a pretty good analogy for what happens inside the subtalar joint. If your foot function is poor (almost always over-pronation tipping in the heel bone), instead of working in the middle of the range of motion of the joint, you work at the end – like the elbow coming to a sudden stop. Each time you do this, it ‘pinches’ the joint on the outer edge and causes pain in the outside ankle area. Over time, the subtalar joint can develop serious wear and tear (osteoarthritis / degenerative joint disease). This condition doesn’t have a common name but is probably best called Lateral Subtalar Joint Impingement. The good news if you have this condition, is that treatment is simple, non surgical and has an extremely good rates of success. As with all degenerative conditions, the earlier you seek treatment, the less damage has time to build up so see your podiatrist without delay. 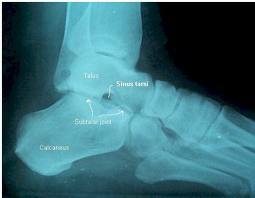 Subtalar Joint and Sinus Tarsi. It is also worth knowing that, until it is quite advanced, the condition cannot be visualised on standard x-rays of the foot. So, if your family doctor has advised you that nothing is wrong with your x-ray, it generally means that you are yet to suffer serious permanent damage. It doesn’t mean that your pain is imaginary, untreatable or not serious enough to address.